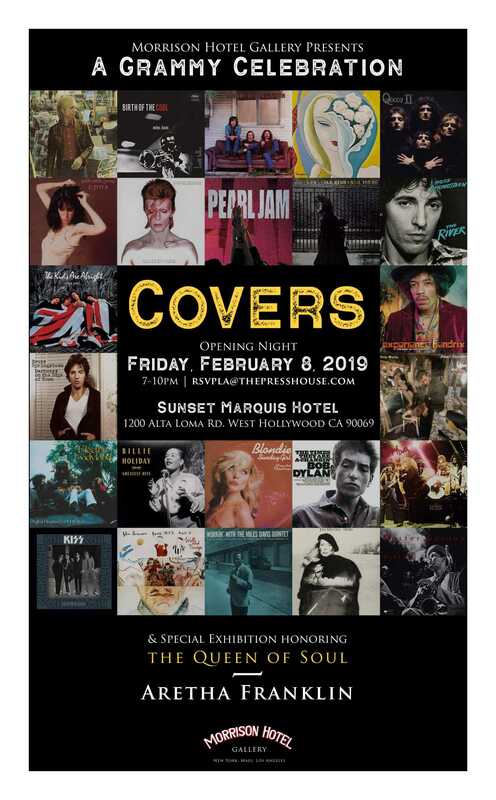 West Hollywood, CA (The Hollywood Times) 02/08/2019 –Directly from the Morrison Hotel Gallery: Over the years, the world’s most timeless musical artists have done more than create sound: they’ve put forth enduring images that invoke a flood of memory and emotion. Every year at the Grammys, legendary musicians gather to applaud the vision that goes into creating a song, an album, and an overall image that makes an indelible mark on hearts as well as history. With the Grammys fast approaching, Morrison Hotel Gallery is saluting the canon of history-making musical legends with a world-class exhibition, A Grammy Celebration: Iconic Album Covers, as well as a special exhibit honoring Aretha Franklin. The photographs that appear on the covers of some of the best albums in music history are inseparable from the music that’s contained inside. These images, captured by the world’s most talented photographers, are intricately tied to the sound and the overall message of the music itself. From the Mick Rock photo shoot that brought about the cover for Queen’s smash Queen II album (and was the inspiration for the “Bohemian Rhapsody” music video) to Frank Stefanko’s gritty shots of Bruce Springsteen that grace the covers of albums such as Darkness on the Edge of Town, the albums and the artwork are forever connected. In addition to a look at album artwork, the exhibition will also feature a stunning tribute to the Queen of Soul. A music legend for the ages, Aretha Franklin exuded power, control, and elegant style in every note and every image – whether she’ was posing in front of a piano in a frothy yellow gown for a Timothy White photograph or mid-performance in shots by Ebet Roberts. The exhibition will open February 9th and run through March 1st at the beautiful Sunset Marquis in West Hollywood. In addition to purchasing prints of the album artwork, guests will also have the opportunity to purchase copies of the actual albums for their listening enjoyment at home. The albums are courtesy of The Record Parlour in Los Angeles.